In episode 5 of “The UC Architects”, Steve Goodman came up with a topic about the (non)sense of Active/Active multi-site DAGs. That discussion – which in essence is about High Availability – was carried forward to episode 6 where I had an interesting talk with fellow UC Architects John Cook and Mahmoud Magdy. I was actually somewhat surprised to hear that most of them were facing the same issues when designing a highly available environment for Exchange, or any other product for that matter. And (for once) I’m not talking about technical issues or difficulties. Instead, I’m pointing to the numerous discussions with the business where you try explaining what high availability is or even better – how to approach their demands. Therefore, I wanted to create this article in which I express my personal take on the concept of “high availability”, more specifically in the area of Exchange deployments. Simply because this is my main occupancy. Nonetheless, I’m sure that some parts will also apply to the broader picture. This article will represent some of my darkest inner thoughts (frustrations?) as well as some real-life experiences interspersed with – what you’ll hopefully find – useful tips. Note I understand that, in the real world, you’ll be faced with things that not always relate to what I’m writing. Hell, I even encounter that regularly! My ramblings below are rather meant as a theoretical insight which you could use to start your work in the battlefield! …a system design approach and associated service implementation that ensures a prearranged level of operational performance will be met during a contractual measurement period. Before reading further, re-read the Wikipedia-definition! I do not always agree with Wikipedia, but there’s an important truth in this definition: measurability.Although high availability system is created by (individual) (technical) elements; the effectiveness of a design/implementation can only be proven if it’s measurable. For it to be measured, you at least need a reference (Service Level Agreement) to compare the measured value against (and determine if you were effective or not) and a common agreement on what and how you are going to measure things. Nowadays, even the smallest deployments tend to have some form of high availability. Why? Simply because it can. Ever since Exchange Server 2007 (and even more with 2010), highly available messaging infrastructures have become a viable and affordable choice for most enterprises. I believe that is a good thing. At least to some degree. On the other hand, the question you should ask yourself: is email really that business critical? By default most enterprises will answer that question with “yes”. As a consultant, you could happily accept that answer and move on… But that won’t get you far, would it? Instead, try asking how critical email is to their business. You’d be surprised of the variety of answers you might be getting. It even gets worse when asking what the uptime of the system(s) should be. I guarantee you that when you’re asking how much a system must be up and running , you’ll hear “as much as possible” or even “all the time.” lots and lots of times. While these answers might seem pretty logical to the business, they prove rather useless when designing a (messaging) solution. They’re useless because none of these statements are really measurable. Question: have you ever tried measuring “as much as possible”? 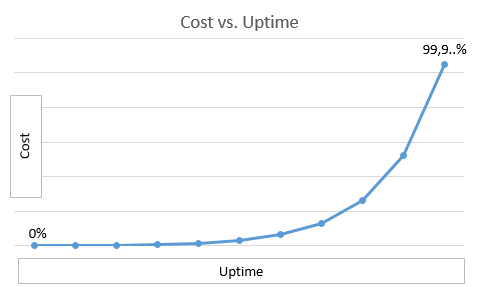 When sitting down with the business to define the uptime, always keep these numbers in mind! It’s your duty to explain what the consequences of a given choice are: costs tend to grow exponentially the more you are trying to get to 100% availability. The questions that now rises is: “what should be measured?”. For instance, measuring the uptime of a server doesn’t seem like a good idea. While that information might prove useful for statistics, a single server’s uptime doesn’t necessarily contribute to the availability of a given functionality. And that’s exactly what we want: measure the availability of a functionality offered to the business. When defining the SLA’s, more specifically the uptime of a system, try disconnecting what should be measured from the (technical) layer below: stop thinking components (e.g. “Mailbox”, “CAS”, …); start thinking “Sending/Receiving Emails” or “Internal access to emails”. At least for now. In a later stage of the process it’s your task to translate these requirements into the correct technical architecture. That’s it for part 1 of this article. In the second part, I’ll continue talking about the process of defining the (business) requirements and translating them afterwards into technical requirements or – architecture. I make sure the customers I communicate set the “right expectations” & the availability of functionality towards business as much as possible.